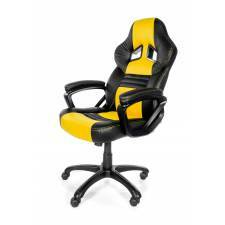 The Arozzi Monza is one cool gaming chair, which has a racing inspired look. High quality, thick padding on the arm wrists, seat and, back gives you the highest comfort. The chair has an ergonomically design, so you sit correct, therefor making you able to play for many hours without issues. The chair is made out of PU Leather, that is both easy to clean, and comfortable. The chair gives you 360 degrees rotation, and can be adjusted in height with the build in Gas Spring. The seat can also tilt and has a built in locking function. Light weight construction makes it easy to move the chair around without the sacrifice of quality. It has 5 high strength nylon wheels to insure stability when having intense gaming moment.